, a celebrated comedian in the reigns of queen Elizabeth and king James, but more justly celebrated as the founder of the college at Dulwich, in Surrey, was born in London, in the parish of St. Botolph without Bishopsgate, Sept. 1, 1566, as appears from a memorandum of his own writing. Dr. Fuller says, that he was bred a stage-player; and that his father would have | given him a liberal education, but that he was ntft turned for a serious course of life. He was, however, a youth of good capacity, of a cheerful temper, and tenacious memory, and in his person of a stately port and aspect; all which advantages are qualifications for, and sometimes incitements to, the theatrical profession. By several authorities we find he must have been on tue stage some time before 1592; for at this time he was in high favour with the town, and greatly applauded by the best judges, particularly by Ben Jonson. 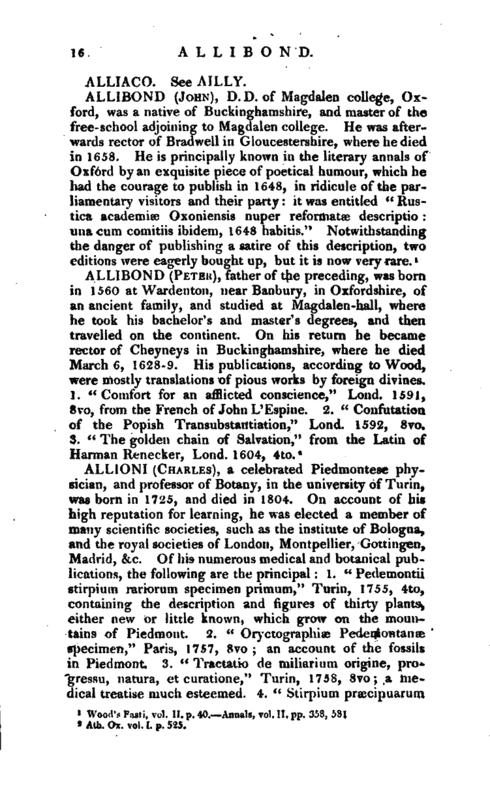 Haywood, in his prologue to Mariow’s -Jew of Malta, calls him Proteus for shapes, and Roscius for a tongue. He usually played the capital parts, and was one of the original actors in Sluikspeare’s plays; in some of Ben Jonson’s he was also a principal performer: but what characters he personated in either of these poets, is difficult now to determine. 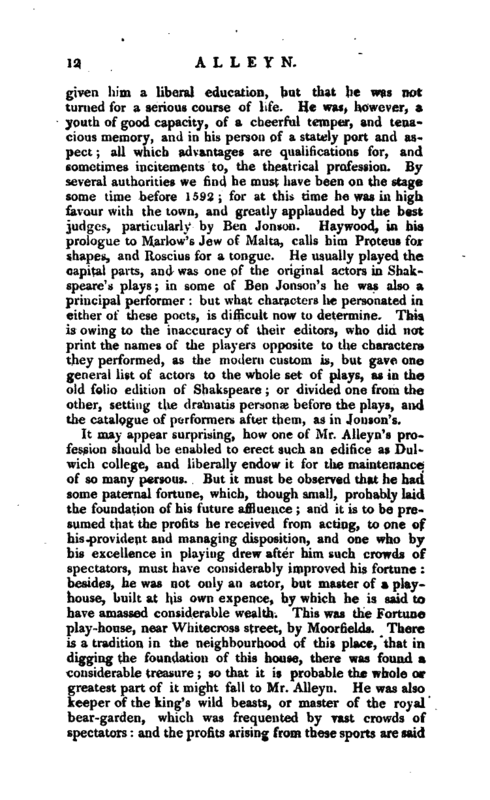 This is owing to the inaccuracy of their editors, who did not print the names of the players opposite to the characters they performed, as the modern custom is, but gave one general list of actors to the whole set of plays, as in the old folio edition of Shakspeare; or divide one from the other, setting the dramatis personae before the plays, and the catalogue of performers after them, as in Jonson’s. The letter is as follows: “I now write to give the king an account of a patent I have stayed at the seal; it is of licence to give in mortmain 800 land, though it be of tenure in chief, 10 iliat w;is the player, for an hos)' I like well that Allen playctu the last act of his life so well; but if his majesty give away thus to amortize his tenures, his court of wards will <] v,.i which I had well hoped should improve. But that which moved me chiefly, is that his majesty now did absolutely deny sir Henry Savile for 200l. and sir Edward Sandys for 100l. to the perpetuating of two lec tures, the one in Oxford, the other in Cambridge, foundations of singular honour to his majesty, and of which there is great want; whereas hospitals abound, and beggars abound never a whit the less. If his majesty do like to pass the book at all, yet if he would of pleased to abridge the 800l. to 500l. and then give way to the other two books for the university, it were a princely work; and I would make an humble suit to the king, and desire lately your lordship to join in it, that it might be so.” The works of Francis lord Bacon, vol. IV. fol. 1740, p. 685. 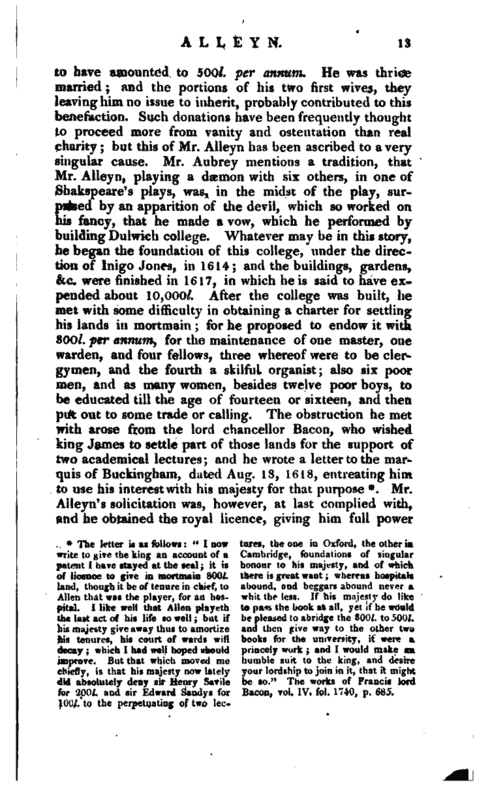 Mr. Alleyn’s solicitation was, however, at last complied with, and he obtained the royal licence, giving him full power | to lay his foundation, by his majesty’s letters patent, bearing date the 2 1st of June, 1619; by virtue whereof he did, in the chapel of the said new hospital at Dulwich, called “The College of God’s Gift,” on the 13th of September following, publicly read, and published, a quadripartite writing in parchment, whereby he created and established the said college; he then subscribed it with his name, and fixed his seal to several parts thereof, in presence of several honourable persons, and ordered copies of the writings to four different parishes. Those honourable persons were Francis lord Verulam lord chancellor; Thomas earl of Arundel, earl marshal of England; sir Edward Cecil, second son to the earl of Exeter; sir John Howard, high sheriff of Sussex and Surrey; sir Edward Bowyer, of Camberwell; sir Thomas Grymes of Peckham; sir John Bodley, of Stretham; sir John Tonstal, of L’arshalton; and divers other persons of great worth and respect. The parishes in which the said writings were deposited, were St. Botolph’s without Bishopsgate, St. Giles’s without Cripplegate, St. Saviour’s in Southwark, and the parish of Camberwell in Surrey. The contents or heads of the said statutes, or quadripartite writings, containing the laws and rules of this foundation, are as follow: 1. A recital of king James’s letters patent. 2. Recital of the founder’s deed quadripartite. 3. Ordination of the master, warden, &c. 4. Ordination of the assistant members, &c. 5. 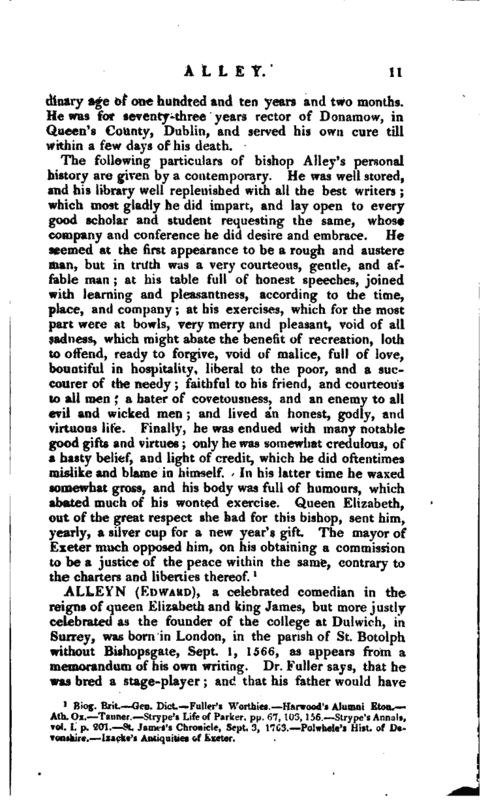 The master and warden to be unmarried, and always to be of the name of Alleyn or Allen. 6. The master and warden to be twenty-one years of age at least. 7. Of what degree the fellows to be. 8. Of what degree the poor brothers and sisters to be. 9. Of what condition the poor scholars are to be. 10. Of what parishes the assistants are to be. 11. From what parishes the poor are to be chosen, and the members of this college. 12. The form of their election. 13. The warden to supply when the master’s place is void. 14. The election of the warden. 15. The warden to be bound by recognizance. 16. 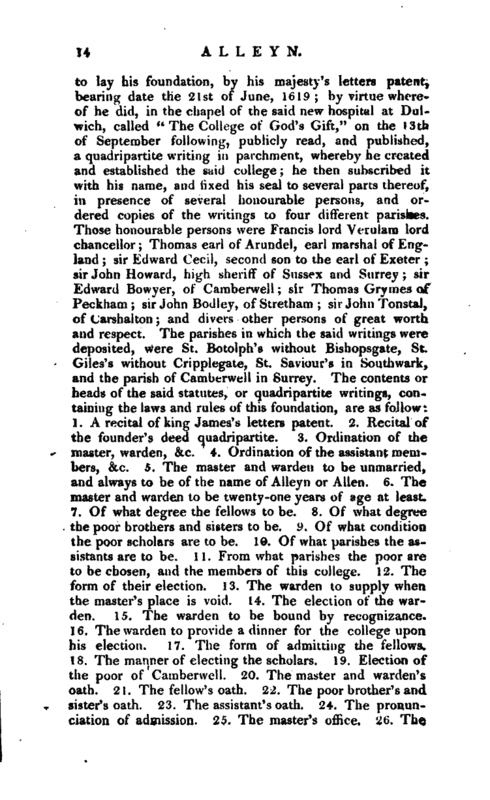 The warden to provide a dinner for the college upon his election. 17. The form of admitting the fellows. 18. The manner of electing the scholars. 19. Election of the poor of Camberwell. 20. The master and warden’s oath. 21. The fellow’s oath. 22. The poor brother’s and sister’s oath. 23. The assistant’s oath. 24. The pronunciation of admission. 25. The master’s office. 26. The | warden’s office. 27. The fellow’s office. 23. The poor brother’s and sister’s office. 29. Thac of the matron of the poor scholars. 30. The porter’s office. 31. The office of the thirty members. 32. Of residence. 33. Orders of the poor and their goods. 34. Of obedience. 35. Orders for the chapel and burial. 36. Orders for the school and scholars, and putting them forth apprentices. 37. Order of diet. 38. The scholars’ surplices and coats. 39. Time for viewing expences. 40. Public audit and private sitting days. 41. Audit and sitting chamber. 42. Of lodgings. 43. Orders for the lands and woods. 44. 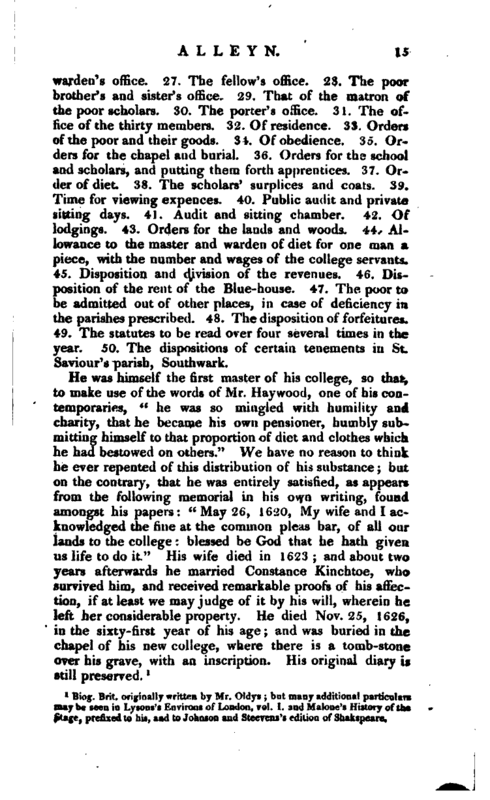 Allowance to the master and warden of diet for one man a piece, with the number and wages of the college servants. 45. Disposition and division of the revenues. 46. Disposition of the rent of the Blue-house. 47. The poor to be admitted out of other places, in case of deficiency in the parishes prescribed. 48. The disposition of forfeitures. 49. The statutes to be read over four several times in the year. 50. The dispositions of certain tenements in St. Saviour’s parish, Southwark. Biog. Brit, originally written by Mr. Oldys; but many additional particulars maybe seen in Lysous’s Environs of London, vol. I. and Malone’s History of the Stage, prefixed to his, and to Johnson and Steevens’s edition of Shakspeare.